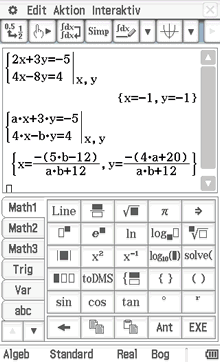 We were the first unofficial source in November 2012 announcing the new Classpad fx-CP400, the first touchscreen color graphing calculator. Today we would like to share more details about this revolutionary calculator. A switzerland store revealed new information concerning the new Casio Classpad Fx-Cp400 (especially related with mathematical functions). 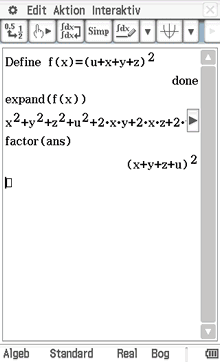 -Algebraic computing with commands such as solve, factor, expand, simplify, approx, combine, collect, etc. -Matrix: Creating matrices in mathematical notation, complete rows and/or columns, Determinant, Transpose, Eigenvector, Eigenvalue. The mathematical functions of the Classpad fx-cp400 are quite similar to the previous Classpad 300/330 models as we expected. However, there is no reference about 3d graphics in that description (and none icon in menu screenshot). Were disclosed the dimensions of the new classpad: 89 x 206 x 21 mm. It is slightly longer than its predecessor with the dimensions 84 x 189 x 21 mm, due to having a larger screen. The first units are expected to hit the European (or at least German) stores in June. The calculator was also announced on China, middle east/asia, Russia and Latin America where should arrive during the summer (undefined date). Australia will receive the fx-cp400 in August. Although it was also announced in USA there is no release date yet. The price that the source report is CHF 199.00 (≈ 160€) and dynatech.de speaks in 149.95€. I bet that the average price will be between 150€-160€ (and may change from country to country, depending eg taxes). I noticed a difference compared with previous models (cp 300/330) related with supported languages (in emulator/calc). Old models allowed choose deutsch, english, spanish, french or portuguese.